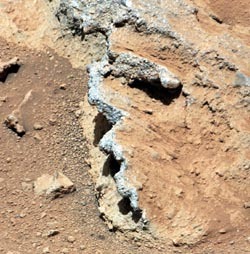 The Shaler Rock Formation on Mars showing layers of sedimentary rock deposited by water. Christadelphian Young Earth Creationist/Flood Geology supporters claim that the sedimentary rock layers on Earth, where fossils are found, are the remnants of Noah's flood and that fossils are the dead remains of the species killed in that cataclysm. rocks laid down by water. 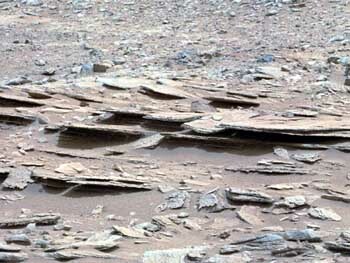 However recent pictures from the Curiosity Mars Rover reveal identical sedimentary layers, laid down by water. There are even rounded pebbles in the area which have been shaped by running water. These pictures are a fatal blow to the entire Young Earth Creationist/Flood Geology theory that is propounded by John Hellawell, Richard Palmer, John Pople and other Christadelphian speakers and is believed by more than half of all Christadelphians today. YEC/FG Christadelphians have previously claimed that the millions of fossils trapped in those sedimentary layers are not evidence of gradual Evolution of species, but rather they are proof of Noah's Flood. Now we know that they are wrong. Fossils show a gradual transformation from the very earliest life forms to the modern mammals and humans that we know today. That evolution of life was either started and guided by God; or if the Atheist position is correct, there is no God and life simply evolved from a common ancestor. Either way, Christadelphian Young Earth Creationists are wrong and they need to listen to their Old Earth Evolutionary Creationist brethren who are on the right track. 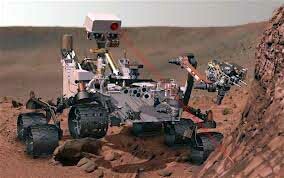 The Curiosity Rover is currently searching for fossils in those Martian sedimentary rocks. When it finds the first one, Christadelphians will be rushing to this website, because it will have proved that Christadelphian Atheists were right all along.